Senior Kennedy Brown dribbles the ball away from her opponent. The Panthers defeated Ark City 81-13 in their season opener. Senior Kennedy Brown has been selected to play in the McDonald’s All-American Game in Atlanta on March 27. The game includes 24 of the top players in the country split into an East and West roster chosen from a nominated pool of over 800+ nationwide prospects. “It’s an honor to be selected to play in this game and get to play against some of the best players in the country,” Brown said in a text. “…It still doesn’t feel real yet. Derby point guard, senior Tor’e Alford, was nominated alongside Brown in early January. “I was excited just to be nominated, but to be selected out of all those players is really cool… it shows that all the work I’ve put in has paid off and been noticed.” Brown said in a text. 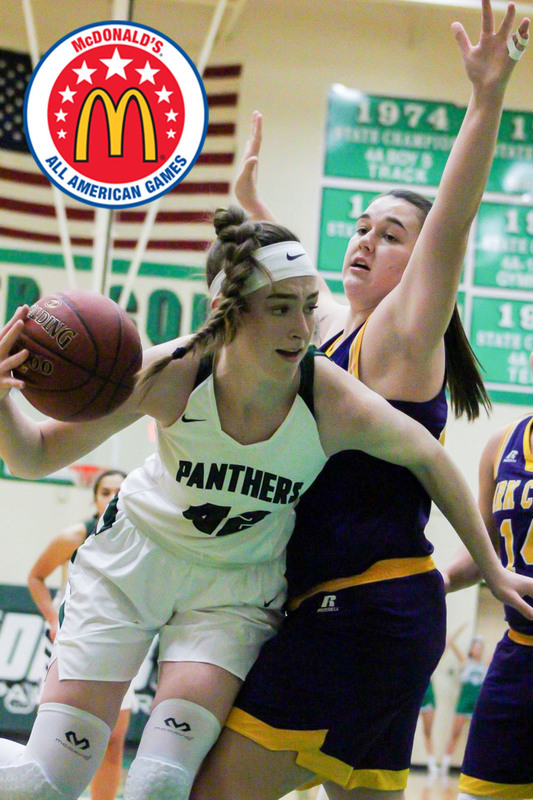 Earlier in the fall, the 6 foot 5 inch senior signed her letter of intent to Oregon State and has become the first person in program history to become a McDonald’s All-American. Last spring, after helping lead the Lady Panthers to the first state title in program history, Brown was ranked No. 16 in the country as a five-star prospect according to ESPN HoopGurlz Recruiting Rankings. Stay tuned to https://pantherstale.com for more updates to come.